Now that my retirement portfolio is recession ready, with zero margin and a total focus on blue-chip dividend stocks, I'm able to aggressively buy deep value stocks again. Bristol-Myers is one of my favorite "fat pitch" blue-chips right now, thanks to Wall Street's overreaction to its risks making it 25% to 28% undervalued right now. Last week, I was able to open an initial position at $46.52 with plenty of cash left to keep buying if it were to fall even lower. While the Celgene merger is going to be complex and result in a highly leveraged balance sheet, the new Bristol-Myers is going to become an FCF minting machine capable of delivering safe dividends and 15% to 26% long-term total returns. If you're comfortable with the risks inherent to big pharma, I consider Bristol-Myers a very strong buy today. 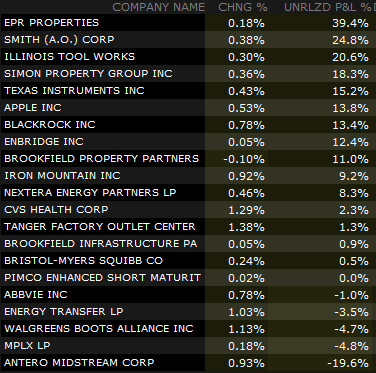 Just make sure to size your position for good risk management (my personal limit is 5% of my portfolio). Like many of you, I've made plenty of investing mistakes over the years. But as long as you learn from such errors and continually improve how you run your portfolio, then achieving your long-term financial goals becomes very attainable. Recently, I explained how I've completed recession-proofing my retirement portfolio (where I keep 100% of my life savings). That mostly related to improved risk management, including eliminating all margin, high-risk stocks, and instead focusing 100% on lower-risk, high-probability "fat pitch" deep value opportunities. That includes the top 5 deep value blue-chip recommendations off a new watch list that's running my retirement portfolio investing strategy. "Fat Pitch" investments are a favorite Buffett metaphor he's been talking about for decades inspired by his admiration of hall of fame hitter Ted Williams. Williams studied batting statistics over several years and in "The Science of Hitting" explained that he could achieve a 40% success rate (outstanding in baseball) if he only swung at pitches in the "sweet spot", directly in the strike zone. Swinging at corner or edge pitches cut his success rate roughly in half. "Unlike Ted, we can't be called out if we resist three pitches that are barely in the strike zone." In other words, Buffett, famous for his focus on minimizing risk ("Rule No. 1: Never lose money. Rule No. 2: Never forget rule No. 1.") is willing to patiently let cash pile up and wait for low-risk, high-probability investing opportunities where the reward/risk ratio is extremely favorable. My entire investing career (including as an analyst) has been built on the shoulders of giants, including Buffett and other value investing legends. So, I've now adopted the "fat pitch" mindset, meaning a focus on deep value opportunities but with a few critical differences to earlier efforts. In the past, my deep value opportunities were lacking in risk-management, including not just investing in higher-risk stocks but also failing to diversify property (I once had 20% of my retirement portfolio in Uniti Group (NASDAQ:UNIT), for example). In addition, I've learned that no matter how undervalued a sector may become, you can't go overboard, such as having 60% of my portfolio in midstream stocks at one point. So, today, I not just have sector caps at 25% and have recently decided to impose 5% company caps on all future investments. Any holdings above this limit will be diluted down over time with fresh investments. Why a 5% holding size limit? For one thing that's the rule of thumb recommendation that Simply Safe Dividends (where I'm an analyst covering over 200 companies each year) makes for our members. What's more, my model Deep Value Dividend Growth Portfolio (one of two model portfolios I track on SA) has shown me that more diversification works better for my particular investing style. How much better? Well, despite the hottest Q1 for the S&P 500 since 2009, DVDGP managed to outperform the market by 6%. That's despite owning 80 companies (largest position is 2.3% of portfolio) and putting money to work each month, opportunistically dollar cost averaging into above average companies at fair value or better. Basically, DVDGP has shown me, backed up by my own experience with hyper-concentrated portfolios, that lots of smaller buys on quality blue-chips is the best strategy for me. The reason I keep individual trades small is so I can "catch a falling blue-chip with conviction". That means using tightly packed limit orders to buy at multi-year lows, and then keep adding until I either run out of money or hit my 5% position size limit. I've set up my new master watch list (115 companies and counting) to rate each company on a proprietary 11 point quality score, based on dividend safety, business model, and management quality. Level 8 indicates a blue-chip and level 9 and above is a sleep well at night or SWAN stock. My strategy going forward is purely focused on 8+ score dividend blue-chips/SWAN stocks. As you can see right now, there are five blue-chips trading near my target price (both undervalued per dividend yield theory AND near 52-week lows). Three of those are at or below my target price (where I set limit orders). When one of my watch list blue-chips gets within 5% of my target price (in the batter's box waiting for a fat patch), I set limits to buy in $2,000 increments. I've recently explained why I backed up the truck on CVS Health (CVS) and, next week, will explain why I also bought a lot of Walgreens (WBA) on the day of its 13% earnings crash. But today, I'd like to explain why last week I was thrilled to see my first Bristol-Myers (BMY) limit trigger. So, let's take a look at both why Wall Street hates the stock so much right now (it's trading at multi-year lows) but also why those fears are likely overblown. In fact, thanks to the incredibly accretive Celgene (CELG) merger, I consider Bristol-Myers to offer one of the best potential total return profiles of any blue-chip dividend stock in America. From today's price (25% to 28% undervalued), Bristol-Myers is capable of potentially delivering 15% to 26% CAGR total returns over the coming five years. For a recession-resistant pharma giant, with a safe dividend and several major short-term growth catalysts, I consider Bristol-Myers a classic Buffett style "Fat pitch" investing opportunity that is worthy of your consideration. 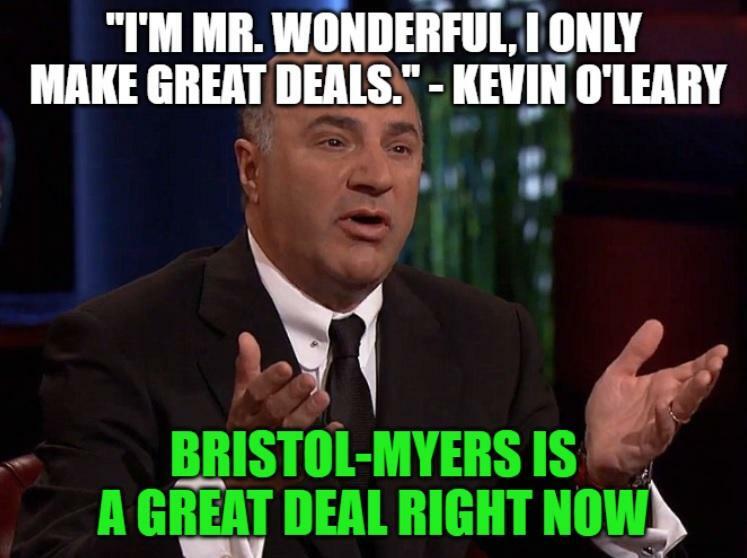 In fact, I have three more limits set for Bristol-Myers now and plan to keep buying it up to the point where 5% of my net worth is investing in this high-yield SWAN stock. It's been a horrifying few years for Bristol-Myers shareholders, who have watched the stock price crash almost 40% from its mid-2016 highs. There are two big reasons for Wall Street hating Bristol-Myers such a red hot passion. The first is the Bristol-Myers' $90 billion planned merger with biotech giant Celgene, the largest M&A deal Bristol-Myers has ever attempted and one of the largest in corporate American history. Good M&A is very hard to pull off, and according to the Harvard Business Review, 70% to 90% of acquisitions fail to deliver shareholder value. Those that are successful tend to be small, funded with cash, and at valuations that are all but certain to be highly accretive to EPS and FCF/share. The Celgene merger is enormous, funded with $32 billion in debt ($52 billion including CELG debt assumption) and involves issuing $38 billion in new shares which dilute existing shareholders. And since Bristol-Myers is paying a 54% premium for Celgene (based on its price before the deal was announced), investors are naturally worried this is exactly the kind of debt-funded mega-deal that typifies late-stage bull market empire building. Perhaps the most concerning part of this merger is what it means for Bristol-Myers' balance sheet, headed into a possible recession in 2020. 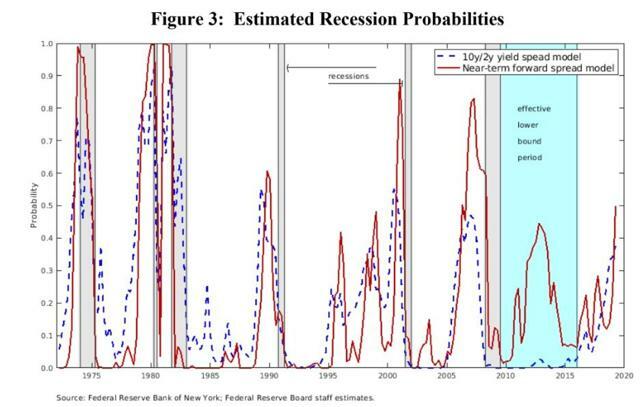 In a February 2019 report, the New York Fed estimated the probability of a recession beginning in early 2020 at 50%, the highest risk level in 10 years. In all recessions credit markets tighten, bond spreads (the difference between corporate yields and 10-year Treasuries) widen and investors want to make sure they are hunkered down in companies with fortress-like balance sheets. Without the Celgene acquisition, this is what Bristol-Myers' balance sheet looks like. The company has no net debt, a sky-high interest coverage ratio, a rock solid A+ credit rating, and thanks to international bond issuances, a lower effective interest rate than the US Treasury (2.9%). In fact, Bristol-Myers' cost of borrowing is 11.5 times lower than its fantastic returns on invested capital, a proxy for quality management that puts shareholder capital to work wisely and profitably. But here is what Bristol-Myers' balance sheet is going to look like once the merger closes in Q3 2019. Moody's, Fitch, and S&P have said that they are considering downgrading Bristol-Myers' credit rating one to two notches over this deal (one is most likely). Bristol-Myers' leverage is going to soar to double the industry average and 33% above the safe 3.0 levels for most corporations. The interest coverage ratio is going to fall by over 50% and its cost of borrowing is going to increase by 0.5%. And then, there's the concerns investors have about Revlimid, Celgene's blockbuster myeloma cancer drug that was set to lose patent protection in 2022, but those patents are now being challenged in court. With Revlimid's sales already set to fall steadily over time; if the courts invalidate Celgene's patents, Wall Street fears Bristol-Myers will be overpaying for a dud and taking on a mountain of debt, possibly right before a recession, to do it. And, of course, we can't forget the reason that so many healthcare blue-chips are trading so cheap right now, political/regulatory risk. Take a look at some recent headlines that have been spooking investors. Those are all Democrats trying to "get tough" on big pharma. But both sides of the aisle have their populists. In fact, President Trump has gone so far as to say that drug makers are "getting away with murder." And recently, the Trump administration has ordered the FDA to revamp the process by which generics and biosimilars get approved to help lower drug prices. What's more, the FDA has said the current drug system in this country is "rigged" so that Americans are paying far higher drug prices. That's especially true for specialty drugs which account for just 2% of drug volumes in the US but 50% of drug spending. That basically makes Bristol-Myers a pure-play specialty drug maker, one whose high margin business focus has led to steadily rising returns on capital and profitability. But if DC implements all of their proposed changes, such as the Democrat's beloved "Medicare-For-All" single payer system, then the entire healthcare sector could see profits slashed by much lower prices, either through price controls or the US government becoming the only buyer of drugs in the country (and thus being able to force much lower prices that way). So, with all these risks hanging over Bristol-Myers, why am I bullish enough to buy this beaten-down blue-chip and recommend it to readers? For three important reasons, that make this one of the best "fat pitch" deep value investments you can make today. If any of these things don't happen, single payer won't become reality in the US. Is it possible that all three might occur? Sure, anything is possible, but good investing is about probabilities and what's most likely to happen, not obsessing over unlikely worst-case scenarios that might hurt a company's fundamentals. If you want a risk-free investment, you need to stay out of stocks and own US treasury bonds. What about the non-single payer proposals that have been flying fast and furious from the Trump administration? Well, remember the man is running for re-election and needs to seem tough and attempting to fulfill campaign promises. Healthcare companies spend $250 million per year lobbying politicians in both parties, to ensure that any actual regulatory changes are toothless enough not to decimate their profits. Remember how Obamacare was going to bankrupt health insurance companies, medical device makers, and pharma giants? Yeah, that didn't happen. Anyone who made the high probability investing decision that "this time won't be different" and that politicians always talk a big game but seldom deliver actual change was handsomely rewarded with market-beating returns. Am I endorsing such corruption? No. But good investing is about making money, not making moral claims about what should happen. Profits are derived not from hoping for a world you think should be, but investing in the one that exists. Anyone buying healthcare stocks, including pharma blue-chips like Bristol-Myers, is making a bet that existential risk will remain just that, risk, but not something that actually comes to pass. If you can't personally stomach this, then don't own any healthcare stocks (you don't need to own every sector to do well in the market). What about the Bristol-Myers/Celgene merger that Wall Street is worried management is overpaying for? Well, guess what? Celgene was down 40% when Bristol-Myers made its buyout offer (due to Revlimid patent worries). In fact, Celgene, at the price Bristol-Myers is paying, is the 6th most undervalued biotech in America. OK, but what about Revlimid's patent challenges? At the recent JPMorgan Healthcare conference, its CEO told analysts that Bristol-Myers has conducted "very deep due diligence" and is "very comfortable" with Revlimid's IP protection. Bristol-Myers' capital allocation over the last few years is why its returns on invested capital are among the highest in the industry. That's strong evidence that management knows what it's doing. In this case, upon due diligence, Bristol-Myers is convinced it's getting Celgene at a bargain price, and as I'll explain in a moment, they are right. Finally, there's the most important thing income investors care about, dividend safety. After all, dividends are like royalties and just as Shark Tank's Mr. Wonderful loves his royalty deals, there's nothing like a rising dividend to minimize risks in investing. That's because eventually, dividends will recoup your investment, but you'll still own your stake in the company, which, if well run, will increase exponentially in value over time. Well even with the company's leverage ratio soaring to four (and it facing credit downgrades), Bristol-Myers' credit rating will be A- and its Simply Safe Dividend safety rating (has predicted 98% of dividend cuts from US companies since 2015) drops from a sky-high 99 to a still safe 79. But wait it gets better! Bristol-Myers' dividend safety will likely be back to "very safe" relatively quickly. That's based on what its CFO told analysts at the merger conference call. Moody's says they expect Bristol-Myers' leverage to fall to 3 or less within two years. And Bancroft saying the company plans to deleverage "Pretty quickly" supports that. But here are the actual numbers backing up my confidence in Bristol-Myers' balance sheet and the safe nature of its payout (a 9 out of 11 SWAN on my quality score). Post-merger, Bristol-Myers' 2.4 billion shares will cost it $3.9 billion per year in dividends. But the Celgene acquisition is so accretive, with management predicting a 40+% EPS jump within 12 months of closing, that Bristol-Myers' FCF payout ratio is going to fall from 53% to 26%. That translates into about $11 billion per year in retained free cash flow (after paying the safe dividend) that, within three years, could pay off 40% of the merger debt and reduce the leverage ratio to 2.3. Within five years, Bristol-Myers might be able to completely pay off its debt, and the entire time the dividend will be safe and likely growing at its traditional token amount (2% per year) between occasional double-digit increases. OK, so now that I've shown why Bristol-Myers' risks aren't nearly as dangerous to its actual fundamentals as the price might imply, here's another reason I'm so bullish on the company. That would be the Celgene merger representing one of the most obvious short-term capital gains catalysts on Wall Street today. First, it should be pointed out that the proxy fight that activist investor Starboard was gearing up for has collapsed in the face of ISS blessing the deal and recommending institutional investors (mutual funds and asset managers) vote for the deal. That means that barring Celgene shareholders voting the deal down (unlikely but possible) or regulators blocking it (analysts consider that a low probability risk), the merger will be completed as planned. Now, it's certainly true that big mergers are hard to pull off well. But as you can see, pharma is one of the most M&A heavy sectors (tech is another big one) with numerous big deals over time, both for Bristol-Myers and Celgene. If you are going to own any company, you need to have confidence that management knows what it's doing. 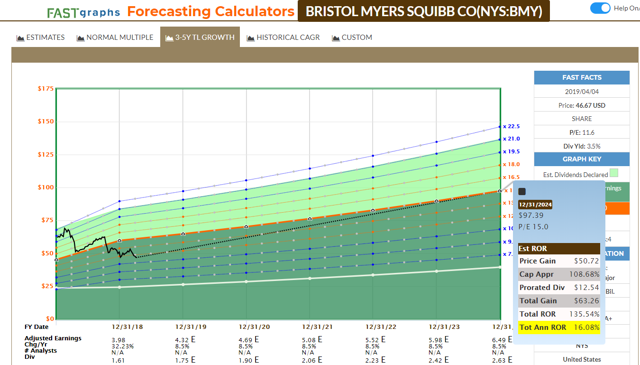 Given Bristol-Myers' solid 10-year track record on safe dividend growth and steadily rising and industry-leading ROIC, I have more than enough confidence to potentially entrust up to 5% of my life savings to Bristol-Myers' leadership. But why am I so excited about this merger and confident that it could turn Bristol-Myers into one of the best of the next five years? For one thing, the new Bristol-Myers is going to be one of the world's largest drug makers, with $2.5 billion in synergistic cost savings that would drop directly to the bottom line (free cash flow). But synergies are far from guaranteed which is why the biggest reason to love this deal is that it creates an oncology/immunology powerhouse. Bristol-Myers is one of the most dominant names in large, fast-growing, and incredibly lucrative drug sectors like cancer, immunology, and cardiovascular medications. EvaluatePharma estimates that by 2024, the oncology and immunology markets alone will be almost $270 billion in size. And guess what? Combining Celgene and Bristol-Myers' current drugs plus late state pipelines will mean Bristol-Myers is likely to capture an enormous amount of that market. In addition to 41 early-stage (phase I and II) oncology and immunology drugs (out of 50 early stage drugs in development), Bristol-Myers will have six late-stage drugs. These consist of four cancer drugs and two immunology blockbusters that management is confident will receive approval in 2019 and 2020. If Bristol-Myers can deliver those drugs to market, then it thinks that those six drugs alone will bring $15 billion per year in sales once ramped up. For context, in 2018, Bristol-Myers' sales were $22 billion. The Celgene deal closing boosts revenue 50% overnight and the successful launch of those six blockbusters would possibly take Bristol-Myers' sales to $50 billion and make it the largest specialty drug maker on earth. Ok, so that's the promise of this deal. But as with any merger or any investment for that matter, you always have to remember that there will be challenges and things can and will go wrong. That's why investing in stocks is a game of probabilities and risk management (you can never eliminate risk, just minimize it with diversification and buying stocks at low valuations). Which brings me to the third and possibly biggest reason to be bullish on Bristol-Myers and consider adding it to your portfolio today. Bristol-Myers is so hated now that it's currently trading at the same levels as late 2014. But while some may see a chart like this and think "value trap! Avoid! ", I see the potential for a high probability opportunity to make venture capital/private equity-style returns with a low-risk, high-yield blue-chip. Bristol-Myers is now trading at a forward PE of 11.2, which is half its 10-year average. But if the Celgene merger goes through (which I and most analysts think is likely), then Bristol-Myers' 40% earnings jump (because it's buying Celgene for a song) will drive that earnings multiple to under 7. That's literally a venture capital valuation. Or to put another way, Bristol-Myers today is a Shark Tank deal but available to blue-chip retail dividend investors. What do I mean by that? Well, typically, venture capitalists are looking for at least 20% to 25% long-term return potential because the risks of investing in private companies early in their growth cycles are very high (over 90% of Silicon Valley VC deals go to zero). Bristol-Myers' adjusted PE ratio merely returning to a sane level, like Chuck Carnevale's (SA's valuation guru and the founder of F.A.S.T Graphs) rule of thumb 15 PE, would deliver 16% annual total returns over the next five years. That's compared to 1% to 7% CAGR total returns that Morningstar's 2019 survey of analysts/asset managers expects from the S&P 500 over the next five to 10 years. So, from that perspective alone, Bristol-Myers is as close to a "no-brainer" low-risk investment as you can find on Wall Street. But wait, it gets better. Over the past 10 years, which includes Bristol-Myers' transition to a pure-play specialty drug maker, the company's average growth rate was 7.7% and its average adjusted PE was 22.3. If the multiple returns to that over the next five years (when most of the Celgene merger debt will be gone and its risk profile will be much improved), then investors would see a nearly 24% annual return. Currently, analysts expect Bristol-Myers' pipeline to deliver 8.5% long-term earnings growth, 10% above its historical norm. So, assuming the PEG ratio remains constant, Bristol-Myers' realistic top-end multiple could be 24.6 which would be a 25.5% CAGR total return over five years. That's literally VC style returns, but from a low-risk, recession-resistant blue-chip pharma stock. But since valuations are educated guesstimates and total return expectations are based on probabilities, it's a good idea to use multiple approaches to confirm a company is a true deep value, "fat pitch" candidate. So here's what dividend yield theory, my favorite blue-chip valuation method, has to say about Bristol-Myers. Dividend yield theory has been proven highly effective since 1966 when asset manager/newsletter publisher Investment Quality Trends began using this valuation technique as the sole method of recommending only blue-chip dividend stocks. Decades of market-beating returns with 10% lower volatility have proven that it's a winning strategy. In fact, according to Hulbert Financial Digest, over the past 30 years, IQT's risk-adjusted returns are the best of any investing newsletter in America. DYT simply compares the yield to its historical norm. As long as the business model remains stable and the growth rate roughly the same, yields tend to return to historical norms that approximate fair value. Given that Bristol-Myers' growth rate is expected to be 10% faster than its historical average and the Celgene merger provides a realistic catalyst to exceed even that estimate, it's not unreasonable to assume that Bristol-Myers will eventually return to a 2.6% yield. That would mean the stock is 25% undervalued today, has 34% upside to fair value, and over five to 10 years the valuation reversion to the mean would generate 3% to 6% returns all on its own. That's how DYT estimates that Bristol-Myers' valuation-adjusted total return potential is 15% to 18%, in-line with the historical PE analysis. Ok, so historical valuation comparisons paint a bright return future for Bristol-Myers bulls if the merger goes as planned. But what if these simplistic (though time tested and proven) methods are missing something? To confirm that Bristol-Myers is indeed about 25% undervalued, let's look at Morningstar's three-stage discounted cash flow analysis, built by industry experts, using some of the most conservative growth assumptions on the Street. Morningstar agrees that Bristol-Myers is dirt cheap right now, being 28% below its fair value estimate making it a wide moat 4-star valuation rated "strong buy". I'm estimating Bristol-Myers is about 27% undervalued making it a "very strong buy" under my personal valuation scale. But no matter what method you prefer, the point is that Bristol-Myers' valuation is the best it's been in years, creating a margin of safety that provides a lot of cushion in case things go wrong. Margin of safety, created by buying quality companies at very low prices, is one of the hallmarks of good value investing. If the merger closes, then investors buying Bristol-Myers today are paying 6.7 times forward earnings. Unless the wheels totally fall off a company, paying a single-digit earnings multiple is likely to earn good returns over time. Paying less than 7 times earnings? Well, that's a very rare opportunity indeed and, typically, only seen at the bottom of major market crashes like 2009. But thanks to the market's ability to be infinitely stupid in the short-term, due to excessive pessimism on quality blue-chips; today, Bristol-Myers is offering one of the best "fat pitch" dividend investment opportunities I've ever seen. 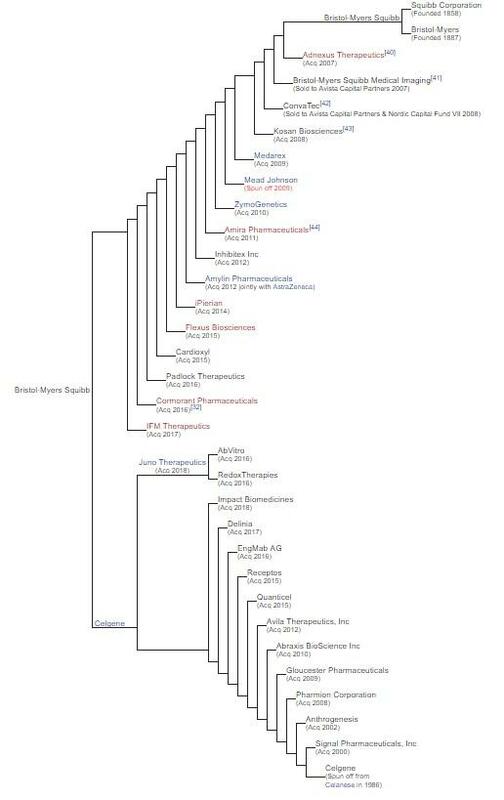 Does that mean I'm going all into Bristol-Myers? Heck no. Remember that all stocks are "risk assets" and Bristol-Myers faces plenty of risks that could result in future multiple expansion being far less than the best case scenario (24.6 forward PE). But that's why you diversify and cap your position at a level where you can withstand the thesis breaking. If the only way you can make money is never being wrong, then your investing strategy is high-risk and will eventually lead to disaster and a permanent total loss of capital. On the other hand, my goal is to focus on low-risk/high probability blue-chip opportunities that will pay off big 60% to 80% of the time. The misses will not mean companies going to zero, but rather flat to slightly negative returns, on a small portion of your portfolio, that will be swamped by your winners and dividend stream. Since adopting an ever tighter focus on blue-chip dividend stocks, my success rate, both for article recommendations, and my retirement portfolio returns have greatly improved. In fact, I'm now in the top 0.3% of all analysts tracked by tipranks, including 5,300 that work on Wall Street. 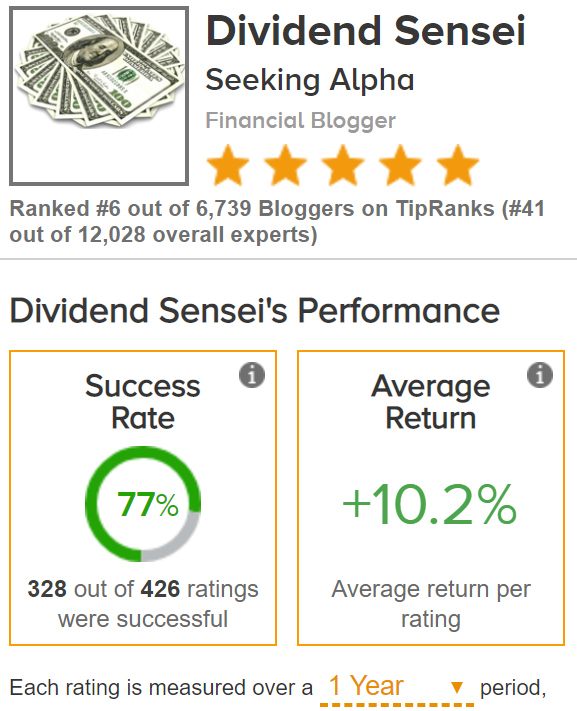 While 12-month forward returns are hardly the definitive sign of a quality analyst, the fact that my simple, and increasingly low-risk, fundamentals, and valuation driven approach is beating 99.7% of other analysts and bloggers is a testament to the power of this simple and time tested strategy. That's not surprising given that I've basically adapted it from the greatest investors in history, including Buffett, Graham, Dodd, and Lynch (with plenty of inspiration from the VCs on Shark Tank). Value dividend growth investing isn't a get rich quick scheme and I'm not saying Bristol-Myers has bottomed. The reason I didn't buy four times as much is precisely that, in the short-term, Wall Street pessimism can run deep and BMY might end up falling another 5% or even 10%. That's why I have the cash set aside (and limits in place) to buy Bristol-Myers aggressively should it keep falling. The "catch a falling blue-chip with conviction" strategy, aka "be greedy when others are fearful" has served me well. It sometimes takes a while for Wall Street sentiment to turn. But as long as a company's fundamentals are sound, then over the long-term, growing cash flow will always be rewarded. My biggest gains were all on quality stocks that I bought on peak pessimism (during corrections) and, relentlessly, hammered the cost basis down until they eventually bottomed. I'm confident that Bristol-Myers will be joining the ranks of my big winners, with impressive annualized total returns 12 to 24 months from now. Bottom Line: Bristol-Myers Is One Of My Top "Fat Pitch" Blue-Chip Recommendations And The Latest Addition To My Retirement Portfolio. But if you are comfortable with the risks baked into the pharma business model, then taking a modest position in Bristol-Myers right now is, in my opinion, one of the best long-term income investments you can make (possibly, one of the best investments of any kind, period). That's why Bristol-Myers is now trading at about 11 times trailing earnings but a mind-blowing 6.7 times forward pro-forma earnings. That's literally a depression era valuation you typically see only with companies with failing business models, terrible management, and one foot in the grave (who often end up bankrupt and going to zero). In contrast, Bristol-Myers is an industry-leading pharma giant and, after the Celgene merger closes in Q3 2019, will be on track to become the world's largest patented drug maker. One with 30% free cash flow margins, that will quickly pay down its merger debt and decrease its risk profile. That's likely to deliver significant multiple expansion over the coming five years, as Bristol-Myers brings to market six new blockbusters that could make it a Wall Street darling once more. With 15% to 26% CAGR total return potential over the next five years, there aren't many low-risk blue-chips that offer such a high probability of achieving market-smashing returns. Just remember good investing isn't about avoiding risks (all stocks are "risk assets") but managing it. Since all investing is probabilistic, make sure to own Bristol-Myers in a well-diversified portfolio, capping your position to whatever level lets you sleep well at night. In my case, I'm willing to invest 5% of my life savings in the company should it fall another $5 to $6 (to about $40 per share). Disclosure: I am/we are long BMY, CVS, WBA. I wrote this article myself, and it expresses my own opinions. I am not receiving compensation for it (other than from Seeking Alpha). I have no business relationship with any company whose stock is mentioned in this article.